In March,The Bharathi Airtel telecom company has announced Rs. 345 plan for prepaid users with 28GB of high-speed data for 28 days which is similar to the Jio Dhana Dhan Offer as those Jio customers are also getting 1GB data per day. While the daily FUP was set at 1GB per day,but a slight condidtion here is users were able to use only 500MB of data during the day, while the remaining 500MB was allotted for the 12am to 6am period.Have a look at Jio New Offer plans here. 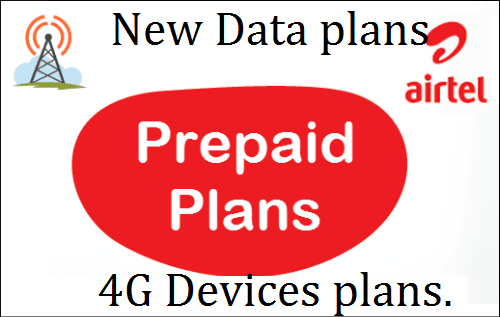 There are four recharges mentioned in the Airetl plans for 4G devices who are entering into Airtel network they are as follows Rs 399, Rs 244, Rs 349 and Rs 149. Now, the Rs 399 (MRP can differ according to circle) this plan details goes like this on recharge of Rs 399/- the user will get unlimited local, STD Calls and 1 GB data per day. The validity is 70 days, which is still less than Jio’s,but good enough. For 3G users the same recharge will have similar call benefits, but only 250MB data on offer. The Rs 244 recharge also has unlimited local calling, free STD Airtel mobile calls, and 1 GB data per day. Again, and the same recharge for 3G/2G customers will get 50MB. The plan has a 70 day validity as well. Now coming to 3rd plan which is Rs 349 plan the users will get unlimited local and STD Calls and 1 GB data per day for 28 days. Again for 3G/2G users, the benefit is reduced to 50 MB. Fourth plan which is Rs 149 plan with 2 GB data, unlimited voice calls for a period of 28 days. For 3G users, the data benefit on this is 50 MB. In April of this year, Airtel upgraded its plan on the recharge of Rs. 345 recharge pack to offer double the data to 2GB per day without any restrictions on the timing that was previously offered so this is clearly showing to beat out its competitors which are offering 1GB data per day. 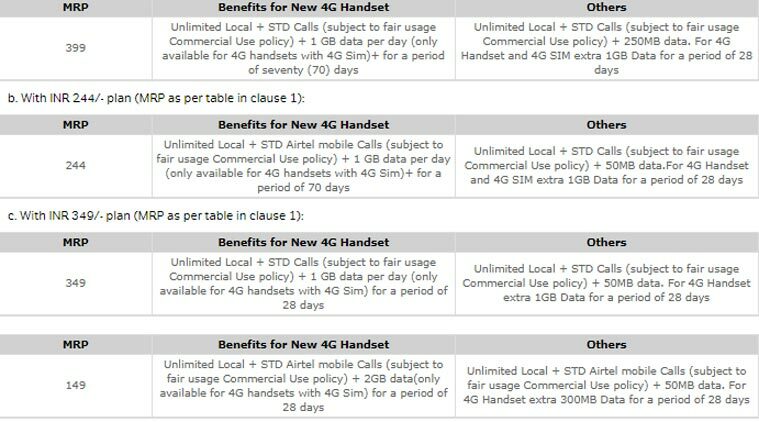 If we compare Jio and Airtel plans over the free calls and sms both are similarly equal but with a few changes they are offering unlimited calls and sms.For the Airtel customers who made calls beyond the 1,200 bundled minutes were charged at 30p per minute (for local and STD calls) which is not the case with Jio but 1200 bundled minutes are best enough for a normal customer. Moreover, And there is another saturation cap for Airtel free calls per day at 300 minutes, after which the charges were 30p per minute. And one more thing to consider with Airtel calling more than 100 unique users in a week entailed call tariff of 30p per minute for the rest of the validity.And BSNL ultra speed Broadband services Download speed at 1 GBPS. While if we look at Rs. 549 plan is still available for users to opt-in, the Rs. 345 plan has been revised to Rs. 349 per month and the daily limit has been reduced to 1GB. The calling benefits are still the same as the original plans, and the day and night time restriction is no longer applicable in either.